Although rivals tend to attack LG’s struggling smartphone business, the tech conglomerate remains unfazed, setting its sights on innovation in its lucrative mainstays, with its focus for this year on research and development. LG plans to invest 19 trillion won ($17 billion) this year, with the bulk of it set aside for next-generation technologies including car components, self-driving sensors, plastic organic light-emitting diodes, camera modules and the bio sector. LG’s keyword this year is R&D, as emphasized last month by Koo Bon-joon, vice chairman of the group’s holding company LG Corp., during his meeting with CEOs from affiliates, including LG Electronics, LG Display, LG Uplus, LG Chem and LG Household & Health Care. “Research and development is a source to prepare for the future and can strengthen business competitiveness. R&D is a precondition for technology expansion and product leadership,” Koo told the CEOs. “In hard times, we should not be complacent about short-term fruition and should not neglect making investment in R&D,” he added. By business, the group’s key unit LG Electronics plans to improve profitability centering on its premium products, including OLED TVs and premium appliances, while generating revenue from its new technologies including artificial intelligence, robots and car parts. 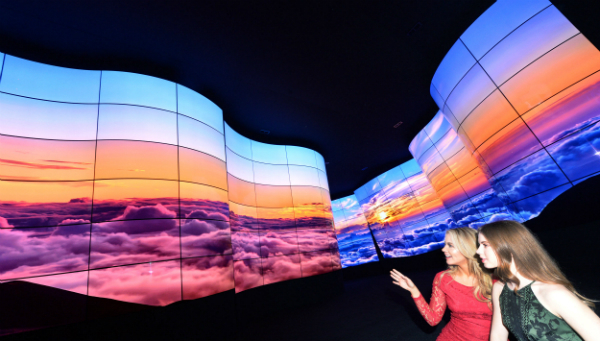 The firm aims to double sales of OLED TVs this year with its plan to unveil 55-inch OLED TVs and AI-powered TVs. In the global TV market, OLED TVs are fast becoming mainstream, with 15 companies joining the OLED alliance. LG plans to ship around 5 million units of OLED TVs by 2020 in its move to lead the high-end market. Its luxury home appliance brand LG Signature will continue to jump into the premium market with the release of new products this year. The firm unveiled the LG Signature OLED TV W with its new Alpha 9 chipset at the latest Consumer Electronics Show. The firm will also launch several home appliances that integrate with its AI brand ThinQ, following the recent release of AI-powered LG Whisen ThinQ that provides customized air-conditioning based on a user’s environment. LG Display, for its part, will cement its market leadership in the large OLED business while strengthening its small plastic OLED competitiveness. In large OLED panels, the firm will upgrade its existing lineups to unveil innovative products, including rollable and transparent OLED panels. LG Display plans to invest 20 trillion won in large OLED and small POLED panels by 2020. The firm plans to begin production at its Paju plant in the third quarter to embrace growing demand for plastic OLED panels that are becoming mainstream in the smartphone market. The group’s basic materials and chemicals arm LG Chem plans to focus on strengthening its existing mainstays, including basic materials, battery and information electronics materials, while fostering new businesses, including energy, water and bio, to create balanced business portfolios. As for basic materials, LG Chem plans to advance its business structure centering on high-valued products and to focus on new materials that are lighter and smarter. LG Group aims to reinvent itself as the nation’s largest research complex by settling in LG Science Park launched in Magok, southwest of Seoul. LG Science Park is a complex designed to explore LG’s future growth engines through research and development of convergence, key and original technologies by creating synergies among affiliates and between outside organizations. The construction of the 170,000-square-meter LG Science Park will be completed by 2020 to accompany 16 research buildings and 22,000 researchers. After the first round of construction was completed in October last year, 8,000 employees from LG Electronics’ R&D units moved, and LG Chem, LG Display, LG Innotek and LG Hausys have followed since. Currently, 12,000 researchers are working at the complex. The number will rise when researchers from LG Household & Health Care and LG Uplus move to the complex next month.